I like this marathon. I finished 2nd overall at the 2011 event, and it was a challenge. The patriotic spirit and history of the area makes this a race to be proud of. The year that Hurricane Sandy chased us though the course and straight to the airport. Beautiful course, well supported. Emotional race for anyone who loves America! If your'e an average pace runner, expect to stay in a crowd the entire race. The USATF-certified 26.2 mile marathon course starts in Arlington, VA on Route 110 between Arlington National Cemetery and the Pentagon. The course moves through Rosslyn along Lee Highway before turning on Spout Run and the George Washington Memorial Parkway. Runners will experience a climb on Lee Highway in the first few miles of the course, but are rewarded with a descent along Spout Run and the Parkway. After crossing Key Bridge into Georgetown between Miles 4 and 5, runners turn right along the renowned M Street where throngs of spectators will cheer them through the most popular area of historic Georgetown. From M Street, MCM runners continue turning right onto Wisconsin Avenue and then left onto K Street, and continue to run on K under the Whitehurst Freeway. Runners then make a continuous loop turning right onto 27th Street, right onto I Street, right onto Virginia Avenue and finally turn right onto Rock Creek and Potomac Parkway, heading north. It’s along the Parkway that MCM runners will enjoy running the beautifully tree-lined roadways and under historic stone-covered bridges before making a U-turn at the median located at Beach and Shoreham Drives. After the U-turn, runners follow the southbound lanes of Rock Creek and Potomac Parkway heading past the impressive Kennedy Center and under the Theodore Roosevelt Bridge. Between Miles 10 and 11, MCM participants travel parallel to the steps of the Lincoln Memorial and then bear left onto Ohio Drive while running under Arlington Memorial Bridge. Runners remain right of the John Ericsson National Memorial as Ohio Drive meet Independence Avenue and then right onto Ohio Drive entering West Potomac Park. Runners continue along the scenic Potomac River and through the emotional wear blue Mile of the course where fallen service members are commemorated in photographs along the roadway decorated with American Flags. Runners continue to move on Ohio Drive and to the very end of Hains Point, as Ohio Drive continues along the other side of the peninsula, adjacent to the East Potomac Golf Course. MCM participants will depart the Hains Point area as the roadway splits, turning onto East Basin Drive before making a left onto Maine Avenue. Through Miles 15 and 16, MCM runners will continue all along the scenic Tidal Basin with views of the Jefferson Memorial. 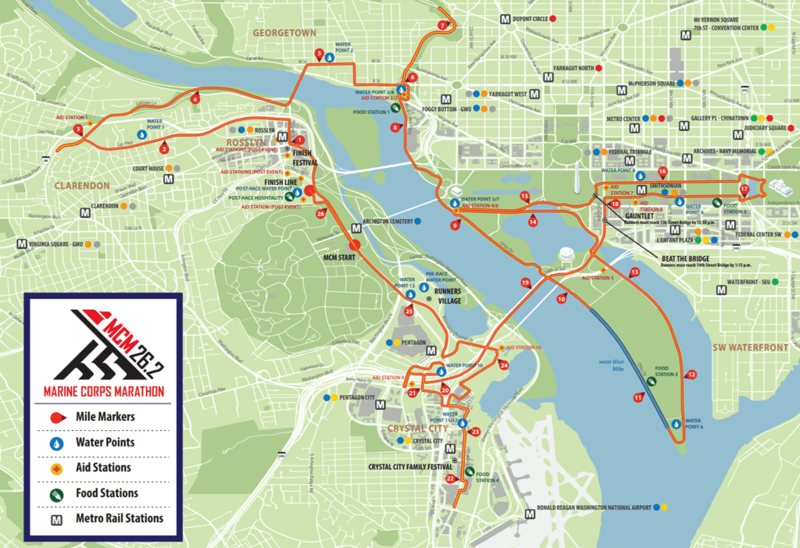 Runners will continue on Maine Avenue as it turns onto Independence Avenue and will head west further along the Tidal Basin crossing over the Kutz Bridge. On Independence Avenue, MCM competitors will run by the Martin Luther King, Jr. National Memorial and the FDR Memorial. 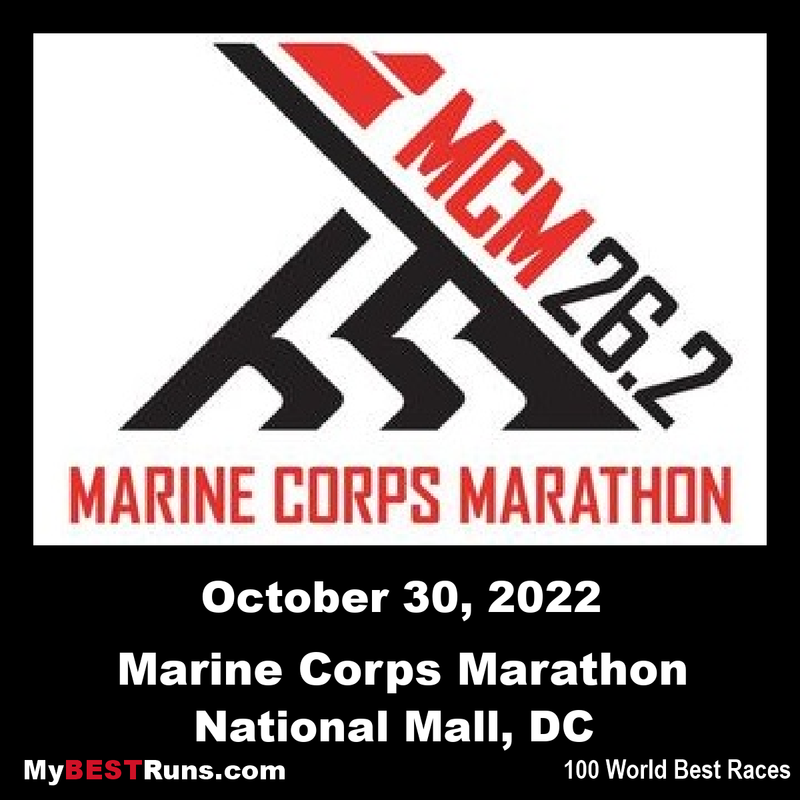 MCM runners then loop back along Independence Avenue on the side closest to the National Mall and the Korean and WWII Memorials and the before making a left turn onto 15th Street at the Washington Monument. AllMCM participants must mantain a 14 minute-per-mile pace.At Mile 17, MCM participants will reach "the Gauntlet" in Washington, D.C. MCM participants who do not make it through the Gauntlet by 12:33 p.m. will be diverted from the certified Marathon course at Independence Avenue to 14th Street and may continue running but will not complete a 26.2 mile course. These individuals will not be recognized as official finishers. MCM runners then continue on the course along the north side of the National Mall, with views of the National Museum of African American History and Culture; the National Museum of American History; National Museum of Natural History and then the National Art Gallery at Mile 18, before turning left onto 3rd Street. The MCM course then moves runners right onto Constitution Avenue traveling toward the U.S. Capitol and continues to turn them right along the inside of East Capitol Circle and onto 1st Street, with impressive views of the Capitol dome. Along the National Mall, runners turn right onto 1st Street Northwest then stay to the left of Garfield Circle, right onto Maryland Avenue and then right onto 3rd Street. At this point, runners will turn left onto Jefferson Drive past the Air and Space Museum, the historic carousel, the Smithsonian Castle and the Freer Gallery of Art. Runners then make a left turn onto 14th Street, passing the Holocaust Museum just before they “Beat the Brigde” at Mile 20. “Beat the Bridge” -- All MCM participants must reach the intersection of 14 and D Streets before the 14th Street Bridge by 1:15 p.m. at Mile 20. From Miles 20 to 21, runners will cross over the 14th Street Bridge and the scenic Potomac River as they head back into Virginia for the last 10K of the course running along Army-Navy Drive. Then runners turn left onto 12thStreet South in Crystal City. All MCM participants must continue to maintain a 14 minute-per-mile pace. Here participants will reach the “Crystal City Gauntlet.” MCM participants who do not make it through the Crystal City Gauntlet by 1:49 p.m. will be diverted from the certified Marathon course at 12thSouth as it becomes Crystal Drive and may continue running but will not complete the 26.2 mile course. These individuals will not be recognized as official finishers. The official MCM course continues along Crystal Drive where the vibrant colors and energy of the Crystal City Family Festival will be on display. From Crystal Drive, runners will turn into the Crystal Park Tower and exit the driveway again onto Crystal Drive. Runners then turn right onto Long Bridge Drive, parallel to the scenic park, and bear left onto Boundary Channel Drive toward the Pentagon. From here, MCM participants turn left onto Connector Road and head back onto Route 110. 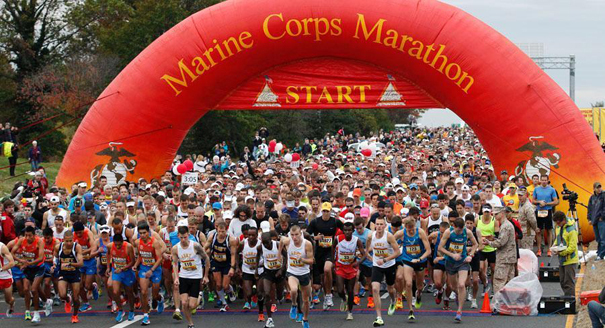 The MCM course unfurls alongside Arlington National Cemetery then, after turning left onto Marshall Drive, offers a final up-hill challenge to the finish at the Marine Corps War Memorial!